Fluorine rarely occurs naturally in biological molecules, and many compounds containing fluorine are toxic. Fluorine is the most electronegative and reactive of all the elements, and it forms an extremely tight bond with carbon that is difficult for enzymes to break down. This can make it a useful additive for pharmaceutical chemicals, but fluorine's reactivity also makes it a difficult element to work with. Fluorine is a common element added to pharmaceuticals because it can increase the drug's selectivity, enable it to dissolve in fats, and decrease the speed at which the drug is metabolized, thus allowing it more time to work. Twenty to thirty percent of drugs contain the element, including some of the most widely prescribed drugs such as well-known antibiotics, anti-inflammatories, anti-depressants, cholesterol-lowering medications, and some inhaled anesthetics. "Fluorine rarely occurs naturally in biological molecules, and many compounds containing fluorine are toxic. 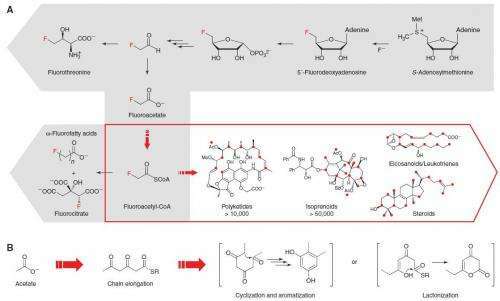 Fluorine is the most electronegative and reactive of all the elements, and it forms an extremely tight bond with carbon that is difficult for enzymes to break down."